I’ve had fun this weekend. In addition to going to the dentist, ordering stair carpeting (we have too many cats–that’s all I’m going to say), and rushing around like a loon trying to do about 2,682 errands, I had the pleasure of taking part in Donnaleigh de LaRose’s Beyond Worlds program at blogtalkradio.com on Saturday night. The theme was astrology and tarot, with a great presentation by Tara Greene. If you were out doing a crazy-load of weekend errands too, never fear– the show is available in the Beyond Worlds archives. And in more tarot-related news, I was happy to hear that Diane Brandt Wilkes has just announced the 2nd Annual Northeastern Tarot Conclave. I had a wonderful time there last year and am looking forward to attending this year. And it’s not far at all for those of you who, like me, live in the NY/NJ/PA corridor of congestion. The Moon’s in Libra as the day begins, and the Big Theme of today seems to be Relationships: Real and Imaginary. We start the day with a Moon/Neptune clash at 1:18 AM EDT, so either we’re awake and slightly woozy-brained, or we’re having really interesting dreams about fantasy partners, which is reinforced by a Venus/Neptune parallel at 4:37 AM EDT, a Moon/Neptune parallel at 12:48 PM EDT, a Moon/Venus parallel at 1:57 PM EDT, and a Moon/Venus conjunction at 4:47 PM EDT. Moon, Neptune, Libra, Venus–what’s real and what’s fantasy? Where do we give too much away in order to be liked or maintain relationships? Is there anything we’re not seeing because we’re too busy being in love with love? These contacts are real “bend me, shape me” connections, so be careful you aren’t pretzeling yourself into contortions just for the sake of peaceful coexistence. These aspects can also make us aware of “higher love”, unconditional love or the feeling of being in tune with the universe–if we’re on the right wavelength. 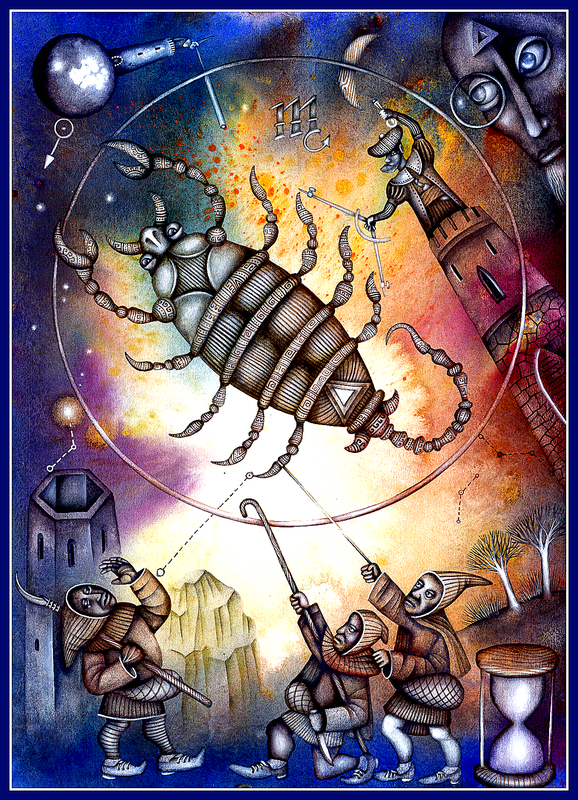 As the day progresses, the balloon stops floating and dips back down to earth as a Venus/Pluto quintile at 12:37 PM EDT unleashes the intense/obsessive side of love and attachment, the one with teeth and claws, which is reinforced later in the evening as the Moon enters Scorpio at 9:45 PM EDT. The lead-up to this involves a Moon/Saturn parallel at 7:29 PM EDT and a Moon/Mercury semi-sextile at 8:59 PM EDT, so things get serious and commitments are tested. You’ll quickly discover the weak points. And you won’t be able to avoid talking about those thorny issues you usually manage to evade. What’s behind the words is just as important as the words themselves. It may be time to get to the bottom of relationship problems that have been plaguing you. Whatever’s been festering deep inside wants to come up for air, although it may feel like you’re in the cast of “Aliens” with weirdo clawing creatures bursting out of your guts. We’re building up to a Mars/Saturn square early tomorrow morning, and this evening gives us a little preview of what’s in the ether (and a “heads up”)! Frustration or repression of instincts can lead to poor timing, misplaced aggression, and angry tirades. Get some sleep tonight so you’re ready to deal with tomorrow’s fireworks!